It is designed to provide information for both members and interested guests alike. For those interested in perhaps visiting with us, please enter information in a contact us form found in the top menu. We meet three times a year at the Dark Horse Tavern in Philadelphia. The Philadelphia Pickwick Club is just one of many Pickwick Clubs found around the world. They meet both in celebration of the great Charles Dickens as well as in celebration of life itself. 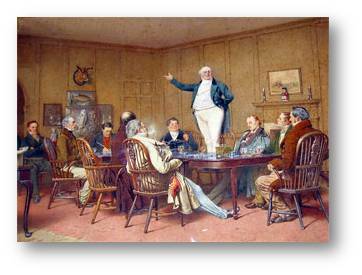 As Dickens said in A Christmas Carol "there is nothing in the world so irresistibly contagious as laughter and good-humour.." A Pickwick meeting generally involves copious amounts of good food, good drink and good humour. Wit and repartee are the order of the day. Meetings generally follow a fixed format with the same general categories appearing at every meeting. The only serious moment of the meetings is the speech always given to the immortal memory of Charles Dickens. It is the only time requiring silence of the members A member giving the speech will generally have gone to some trouble to research an aspect of Dickens. Other than that, it is a free for all only controlled by the threat of being fined a bottle of port.